The ABC recently had a report on plans to power north-west Queensland with low temperature geothermal power using hot water from the Great Artesian Basin. A Brisbane-based company says it could supply geothermal power to all of north-west Queensland. Clean Energy Australasia wants to build a $50 million geothermal power station near Longreach. But it has now also revealed plans to build a pilot geothermal project near BHP's Cannington mine at McKinlay, south of Cloncurry. The company's Joe Reichman says the Mount Isa region needs about 500 megawatts of power a year and geothermal resources could easily provide that. "It'll change the region into a powerhouse," he said. Mr Reichman says the company has applied for federal and state government grants and has support from the major mining companies in the region. If the projects proceed they would be the first geothermal power plants in Australia. Low temperature geothermal power is a relatively new (and very low profile) form of extracting energy from geothermal sources that provides yet another option for meeting our energy needs cleanly and sustainably. When geothermal power is mentioned, people usually think of traditional high temperature geothermal power stations using water from volcanic areas, such as those found in Iceland, New Zealand, the US and elsewhere around the ring of fire. More recently, interest in enhanced / engineered geothermal systems (EGS) - also known as hot dry rock (HDR) or hot fractured rock (HFR) geothermal power - has been high, with a number of experimental projects underway in Australia and Europe. Low temperature geothermal power is also starting to attract significant interest, as lower temperature water resources are common in many countries (for example, waste hot water produced by oil and gas wells - in Texas alone, more than 12 billon barrels are produced, with oil companies usually re-injecting the waste water into the earth) and new technologies are beginning to appear that allow these resources to be developed commercially. UTC Power has developed a low-cost Rankine cycle system that can convert temperatures as low as 195 °F (91 °C) into electricity. The technology is similar to a steam engine, with steam or hot water vaporizes a hydrofluorocarbon refrigerant that drives the turbine (it has been compared to a "refrigerator compressor running backwards"). The Great Artesian Basin provides the only reliable source of water through much of inland Australia. The basin is the largest and deepest artesian basin in the world, covering a total of 1,711,000 square km. It underlies 23% of the continent, including most of Queensland, the south-east corner of the Northern Territory, the north-east part of South Australia, and northern New South Wales. 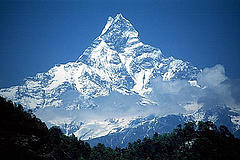 The basin is 3000 metres (10,000 ft) deep in places and is estimated to contain 64,900 cubic kilometres of groundwater. Most recharge water enters the rock formations from relatively high ground near the eastern edge of the basin (in Queensland and New South Wales) and very gradually flows towards the south and west. Because the sandstones are permeable, water gradually makes its way through the pores between the sand grains, flowing at a rate of one to five metres per year. Discharge water eventually exits through a number of springs and seeps, mostly in the southern part of the basin. It takes up to two million years for water to travel to the springs in the Lake Eyre area. Temperatures of the artesian groundwater (which is generally of a very good quality) range from 30o to 100o C at the well heads. As the groundwater is too hot for town water supply and for stock to drink, it needs to be cooled down before consumption. That is why cooling towers can be seen throughout the region. The ABC report's claim that the Longreach plant would be Australia's first geothermal power plant is incorrect. A small (120 kW) power station (pdf) has been in operation at Birdsville in western Queensland since the early 1990's - one of the few low-temperature geothermal power stations in the world. The plant derives its energy from the near-boiling (98 degrees C) water taken from the Great Artesian Basin (at a depth of 1230m) that provides a water supply for the town. Operation of this geothermal power station reduced the town's diesel consumption by about 160,000 litres per year. The Victorian town of Portland (in the Otway Basin) also operated a district heating scheme using water from geothermal sources for about 20 years, though this did not generate power. The UTC plant has been trialled at the Chena Hot Springs in Alaska, with the first plant going online in July 2006. A second unit began operating later that year. Together, the two power units are contributing to the resort owner's goal of making Chena the first totally renewably powered and fueled community in the United States. The Chena experience is motivating other cities in Alaska, including Anchorage to investigate setting up larger scale geothermal plants. UTC installed more production systems at another location in New Mexico in August this year. Utah company Raser Technologies is looking to build a range of geothermal power plants throughout the western United States using Rankine cycle systems, with their first plant going live in Utah earlier this month. Some oil fields also produce hot water which can be used to drive Rankine cycle power plants, with trials being performed in Wyoming. Germany is interested in deriving significant amounts of energy from both EGS / HFR and low temperature geothermal sources. There are already four small geothermal power plants successfully operating in Germany, albeit supplying only a tiny amount of electricity. The first geothermal plant to start operating in Germany is situated in Neustadt-Glewe in the north-eastern part of the country. The 230-kW combined electricity and heat power plant started up in 2003 and extracts water with a temperature of 97 °C from a well 2250 meters under the ground. It supplies 1,300 households with heat and a further 500 households with electricity. Other plants now operating are the 3.5-MW plant at Unterhaching close to Munich, in Bavaria which is the first geothermal plant in Germany to use Kalina cycle technology. 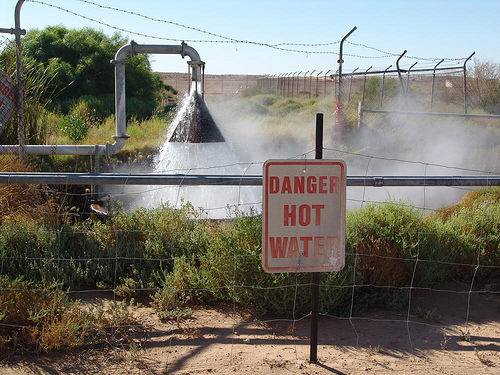 At that plant water is extracted at a temperature of 122 °C from a well 3,500 meters deep. Another 2.5-MW plant in Landau taps water of 150°C that is located 3,000 meters beneath the ground. Another 550-kW plant is due to go into operation in Bruchsal shortly, extracting water at temperatures of 128°C from a well 2500 meters deep. More plants (as big as 8-10 MW) are due to go into operation in 2009-2010 in Sauerlach, Dürrnhaar, Riedstadt, Speyer, Gross Schoenebeck and Mauerstetten. By 2015 there could be more than a hundred plants operating - around 150 geothermal power plant projects are in the pipeline according to the German government. One major constraint on expanding the program has been shortages of drilling equipment. While New Zealand already generates a significant portion of its power using traditional geothermal sources, the country is also conducting a NZ$2.6 million research program into low temperature geothermal power. Low temperature geothermal power has the advantage of being clean, continuously available energy that can be generated in a wide variety of locations. Plants will likely to continue to be relatively small-scale, making it a classic distributed energy generation alternative (like biogas and solar PV), with growth probably remaining low profile for some time. In the long run, I expect we'll see a useful and significant amount of our energy needs being produced using this technology. Cross posted from Our Clean Energy Future. I wonder just how much energy savings can be gained by shrinking this technology to small scale for farms and such? I'm not sure if its possible to shrink these plants down to farm size, but it would be interesting to see if it could be done in an economically feasible way. The technology can be scaled down. Our company is releasing a brand new low temp geothermal technology that works from sources as low as 150F/70C. We can do it cost effectively from 100kw up to 5MW modules. The footprint is small and the cost reasonable. You can find out more at trimodalgeothermal.com. The siite is a little out of date, but you can also see photos of the new system at focusedsolar.com which has just licensed it for solar thermal applications. Interesting site from the last poster. I have no comment on how well the technology works or the investment potential but I surely wish them well. Maybe as a matter of nostalgia from dreams long ago of bringing back the steam engine I am fascinated by the claims of Cyclone Power. It claims its steam engine can run on chicken fat, orange peelings, swamp gas or waste heat. Mother Earth has a very warm heart, warmer than the surface of the sun. There is some residual heat from formation of the planet but heat is constantly being generated from radioactive decay that is expected to continue for about 10 billion years. Some 2 billion years before that, a dying sun will probably have expanded beyond the earth's orbit. The claim that geothermal power is not renewable is ridiculous on its face. Wow! This a great article. This is the kind of technology we need to be focusing on and if it really can be scaled down so that it can be used by small farms humanity may have a chance yet.